Fort Brooke was a historical military post situated on the east bank (at the mouth) of the Hillsborough River in present-day Tampa, Florida. The Tampa Bay History Center, Cotanchobee/Fort Brooke Park, and the Tampa Convention Center currently stands at the site. In 1823, Colonels George Mercer Brooke and James Gadsden of the United States Army were ordered to establish a military presence on Tampa Bay in the newly acquired Florida territory to contain the Seminole Indians and curtail illegal activities along the gulf coast. On 10 January 1824, Brooke and four full companies of the U.S. 4th Infantry Regiment from Pensacola established 'Cantonment Brooke" at the mouth of the Hillsborough River, just about where today's Tampa Convention Center sits in Downtown Tampa. The site was marked by a huge hickory tree set atop an ancient Indian mound most likely built by the Tocobaga culture centuries before. 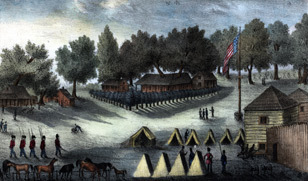 Brooke directed his troops to clear the area for the construction of a wooden log fort and support buildings, but ordered that several ancient live oak trees inside the encampment be spared to provide shade and cheer. In 1824, the post was officially rechristened Fort Brooke. Fort Brooke would serve as a major outpost on Florida's Suncoast during all three Seminole Indian Wars and the Civil War. The fort also played a part in the development of the village of Tampa. In October 1863, the small Battle of Fort Brooke was fought nearby. On May 6, 1864, both Fort Brooke and Tampa were captured by Union Forces. As Tampa languished during the 1870s and early 1880s, so did Fort Brooke. The last roll call of soldiers occurred in 1882 and the post was decommissioned by the US Army in 1883. Shortly after the post was decommissioned, Fort Brooke became an independent incorporated town in 1885; however, the town's charter dissolved when it was annexed by Tampa in 1907. Tampa-Fort Brooke, a single census unit recorded by the U.S. Census Bureau in 1850.